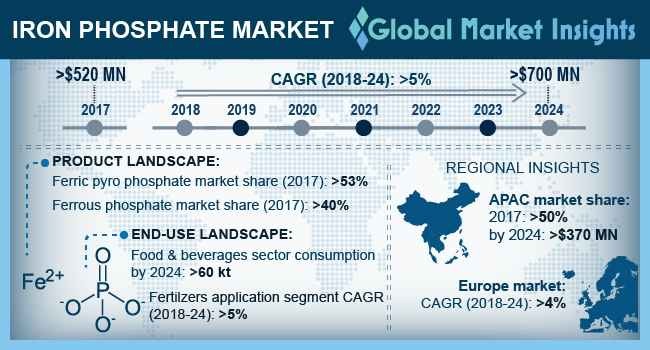 Global Iron Phosphate Market size is estimated to exceed USD 700 million by 2024; according to a new research report by Global Market Insights, Inc. Potential application across various end-user industries including agrochemicals, automotive and consumer electronic industries is expected to drive the global iron phosphate market growth. Increasing demand for molluscicides to inhibit damage caused by snails and slugs will propel product penetration. Ease of application, stability and low solubility are the key factors anticipated to support iron phosphate demand. Rapid developments in automotive industry, focused on enhancing electric car portfolio is likely to fuel iron phosphate business development. Increasing preference for lithium-ion battery owing to the growing electric car fleet across the globe has further instigated the iron phosphate market growth. Key attributes such as improved operational flow, high temperature resistance, safety benefits and greater power density related with the battery are fueling product demand across the automotive and electronic industries. Cost-effective manufacturing cost with higher economic growth rates are positively influencing the overall iron phosphate market size. Moreover, favorable government guidelines including the adoption of eco-friendly and green technologies mainly in Japan, China and South Korea will support the industry expansion. Rise in R&D investments to increase the efficiency of the paint & coatings is another major factor fueling the business growth. Increasing use of FePO4 pretreatment to attain high paint adhesion and corrosion resistance on various metal substrates will also augment the iron phosphate market size. Factors such as withdrawal of FePO4 from the food additives list in European Union is a major factor hindering the iron phosphate market growth. In addition, raw consumption of product may lead to several health problems if not handled properly. Stringent government norms concerning the consumer’s safety are further expected to restraint the business size. Ferric pyro phosphate market volume estimated to hold over 53% iron phosphate market volume share in 2017. Rising health conscious consumers coupled with surging demand for nutritional supplements will provide the strong business outlook for manufacturers. Increasing application scope as a key ingredient in pharmaceuticals to treat patients with iron deficiency has boosted the product penetration. In addition, potential usage in fortifying infant cereals and flours will further support the industry growth. Paint & coatings segment is expected to witness notable growth over the projected timeframe. Rapid infrastructural development coupled with automotive industry expansion is anticipated to propel the iron phosphate market demand. Factors such as lower processing costs, ease of application, flexibility, and excellent paint adhesion are enhancing the product adoption in painting and coating category. Asia Pacific iron phosphate market is the fastest growing region and is expected to be valued at over USD 370 million by 2024. This growth can be attributed to the increasing steel manufacturing units specially in the emerging economies including India, China and South Korea. Steel manufacturers are anticipated to implement vertical integration strategy to avoid additional expenses and gain competitive edge. Increasing necessity to prevent further oxidation of the metal will boost product demand across steel & metal industries. Iron phosphate market share is competitive in nature owing to the presence of many manufacturing companies across the globe. Key industry players include Pioneer Herbal, Imperial Chem Incorporation, Jost Chemical Company, Hefei Asialon Chemical Co. Limited, Aarvee Chemicals, Zhengzhou Ruipu Biological Engineering, Crest Industrial Chemicals, ILVE Chemicals and Charkit Chemical Corporation. Merger and acquisition, new product launches, technological advancements and production capacity expansion are the major strategies adopted by these participants to strengthen their foothold.